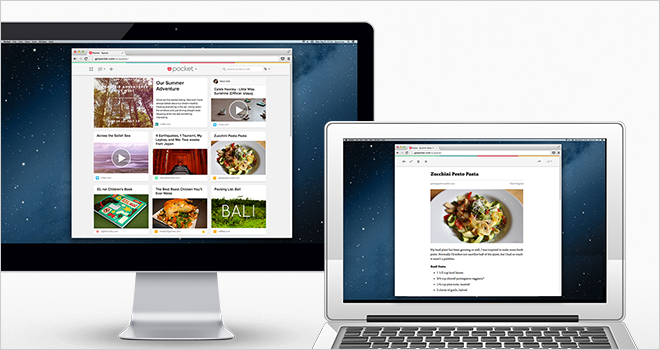 Pocket’s refresh for the web provides a beautiful, faster and more powerful experience for the world’s most popular and innovative save for later platform. The new Pocket for web combines the best features from our mobile apps with high quality web design. Our goal is to provide a seamless Pocket experience for our users on whatever device and browser they choose. The updated Pocket web experience is now available on: Chrome, Firefox, Safari, Internet Explorer 9 and higher and Opera. As with our recent iOS 7 relaunch, we took a hard look at every screen in Pocket and made subtle refreshes to optimize Pocket’s unique and inviting visual design for the web. Our simple and powerful toolbar streamlines all key actions for easy navigation. We’ve also added fully Retina compatible images throughout Pocket to provide a more beautiful experience for our users on all supported devices. Pocket’s updated web experience now enables keyboard shortcuts so you can use one, simple keystroke to: maneuver through articles (j/k), archive (a), favorite (f), jump to the item’s original view (o) and a lot more. To see all of the new shortcuts simply press ‘?’ on your keyboard from anywhere in Pocket. 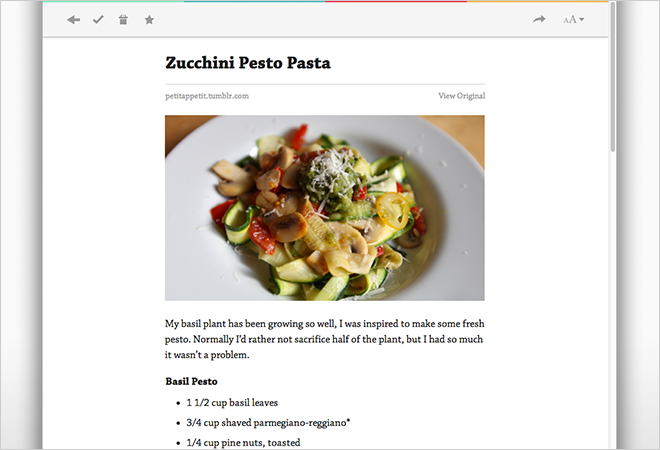 For our web users, we’ve revamped one of the most important parts of Pocket, the Article View. We analyzed and tuned every aspect of the reading experience to make it even more enjoyable and easier to use. New improvements to the Article View include new font faces for greater personality and readability, a new sepia theme option, refreshed layout and typography of each article and support for retina images. In addition, Pocket will now automatically adjust margins, line lengths and line heights to create the most readable view. You can get the best experience, with just a few clicks, without having to configure a ton of options. Ideal for users with large Pocket lists, we’ve streamlined tag and bulk editing in the web experience. Accessing, viewing and editing tags is easier using the new toolbar. Auto completion of your existing tags help make list organization a quick and painless process. We’ve updated bulk edit to be faster and easier to use to help you efficiently archive, delete, favorite or tag multiple items in your queue. Try Bulk Edit by: holding (Shift) or (Command) + clicking any item in your Pocket list. We put a lot of work into the core architecture of Pocket for the web, improving list download speeds and displaying of images. Everything is faster and more fluid. Further, your Pocket list will always be up to date. Whenever you come back to Pocket, your list will be updated automatically. No refresh required. 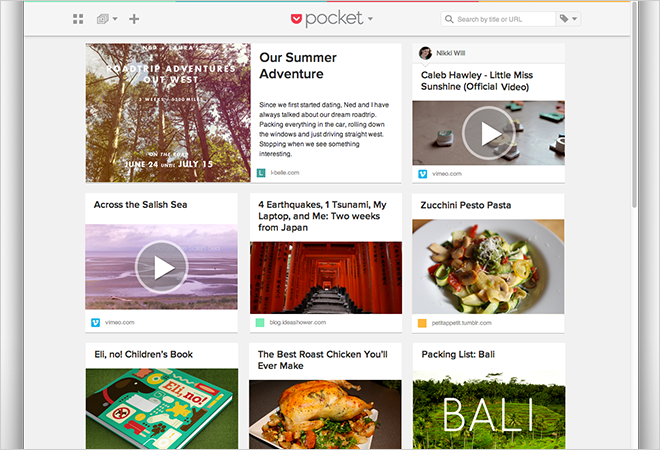 We hope you enjoy the new Pocket for the Web. The Pocket team remains hard at work building the best save-for-later experience for our users and we look forward to sharing more with you soon! If you have questions about Pocket for Web, please feel free to get in touch with us at Pocket Support. For further inquiries email us at: press@getpocket.com.